Add method isn’t removed or depreciated in jQuery, same with toggle. I don’t see the issue. Then it means I am wrong all along. Can you please give me the link on how to use add() & toggle()? The toggle() is removed in jQuert 1.9. Good catch on toggle, add still exists (https://api.jquery.com/add/) (no deprecation/removed notice). I looked for it. Thanks! Then that means I can only post sites that are linked to freeCodeCamp, right? You are free to post anything that doesn’t violate our code of conduct (TL;DR don’t be evil), however we cannot address issues with off-site resources - I get the document was linked to but it’s not produced by freeCodeCamp - we don’t have the ability to change it - and you shouldn’t treat it as a document made by freeCodeCamp. I’m Casey in Oakland with background in IT and digital art. I’m interested in comp sci and problem solving so I’ve been taking courses at my local college. I’m most comfortable with Java, but I want to learn JS too because it’s ubiquitous and probably an essential item in the toolbox. I like eating healthy food, exercising, drinking boba tea. You can usually find me at vegetable section in Trader Joe’s and YMCA on the weekend. I am very stoked to be part of FCC and hope to get to know you better. Hello everyone! I’ve been using freecodecamp as a learning tool for over a year or so, but never really got involved with the forums. I feel I should start here. 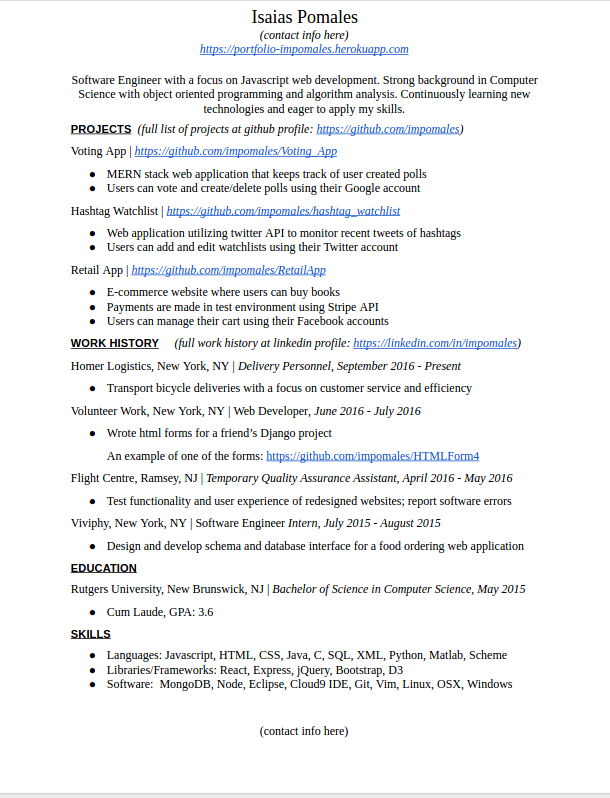 I’ve been trying to get an entry level developer job ever since I graduated a couple years back. I didn’t look for a job right away. Whenever I did, I just didn’t feel qualified for anything. I Took some time to figure out what direction I wanted to go. That’s when I started focusing on web development and using fcc as a guide. I’ve done all of the front/back end projects, and I wished I shared them as I did them so I could get constructive feedback. I’ll put a link here of my portfolio and resume. I think I’m missing the community aspect in all this. I really want to get more involved with other fellow developers. Any feedback would be appreciated. My name is Abes, I’m from France I’m 30 (soon) I’m looking for work-mate or pair-programming I do speak english and french. I’m still working on my portfolio right now. Wish you good luck Hope to hear from you ! Blogging my 100 days of code! I’m currently a student at the University of Bath, England. 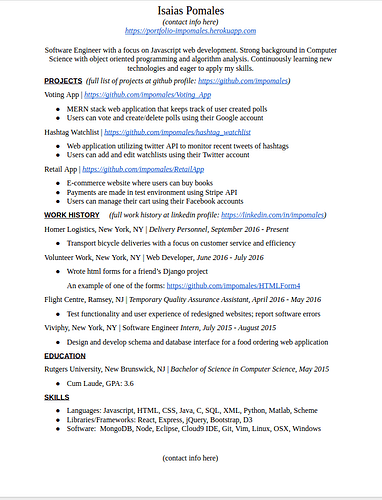 Currently pursuing a Computer Science and Mathematics degree, however I wanted to dabble in web development more specifically full stack development. So I am using FreeCodeCamp as a curriculum to teach myself full stack development. Over the summer months I have spent lots of time completing this curriculum, and I have just recently finished my front end certification. More recently I thought of starting a 100 days of code challenge, alongside this I challenged myself to write a bit about what I did each day, and what occurred during each day. This journey can be read here1. So if anyone is interested in how to/what happens to people while going through their data visualisation and backend certification please feel free to check it out and give me some tips. Any comments are welcome! My name is Michael and i’m a Web Developer. I’ve given up on saying Front End because it’s just annoying to specify that every time and very limiting. I use all the front end languages, preprocessors but I also love utilizing PHP and MySQL. I also know a bit about managing servers. Basically I learn what I need to get stuff done. I’m very hard on myself. I’ve been developing now for 3 years. I kicked off my journey after graduating Community College in 2015 with a comm design degree (not too related). I have not really used FCC over my journey, instead I began on Codecademy, soon moving onto bigger better stuff with Treehouse, Lynda, MDN docs. I’ve really grown a lot and seen a lot of what there is. I love helping out answering JS questions at CodeCademy but there is really little community outside of a Q/A forums there and would love to participate more around here. I’m currently in Philly with my wife, looking for work. I enjoy helping others learning to code, it helps me express what I know and more often than not I explain things uniquely to each persons needs. I’m currently working on an offline admin to help with managing our budget, household, etc. Stuff like tracking stuff as objects in databases, like a vehicle tracking aspects of it individually like when registration is due, last maintanence, and for finances tracking transactions across accounts, individual payments per transaction, etc, etc. Oh and storing login credentials, that has helped a ton! Also I have trouble remembering birthdays so I have a table with everyones info. Alright glad to meet ya! I’m very happy to be here right now. I really want to know more about code, especially HTML because I want to create for myself a website. I hope that I can learn and then sharing for the others by the best way. Coding has been my life and now it is my tools for live. I have nothing special to learn exactly.